So, my girls have allowed me to share their playlists, the songs they love and listen to on a daily basis. Do listen, theres a lot of great music on each of these lists. Perfect for the weekend – and, hallelujah, it is here!! I’m off to see The Chills and Tiny Ruins tomorrow night – might see you there…. Every month Rolling Stone magazine recommends ten new country/Americana artists to hear. It’s a good read and covers the whole spectrum of the massive country genre – from the traditional sounds of Hank Williams/Loretta Lynn to honky-tonk that is pushing right up against other genres, such as funk and soul. The writing has some refreshingly gentle humour in it too: Newcomer Devin Dawson is described as sounding like ‘John Mayer, if he’d grown up listening to Garth Brooks and worried more about other people’s feelings’; and Lucas Hoge as ‘easygoing, optimistic pop-country that won’t upset any delicate constitutions.’ The link is at the bottom of this post. Julia Jacklin, from the Blue Mountains in New South Wales, is a classically trained singer who produced a debut album last year full of confessional, bittersweet alt-country gems. It doesn’t surprise me that she loves Fiona Apple. She’s in concert in Auckland on May 27th at the Tuning Fork – go see her if you can. Aldous Harding and Marlon Williams – both Kiwis, both immensely talented singer-songwriters. This creative couple live in the artsy hub of Lyttleton. Williams blew everyone away with his debut album Marlon Williams. He’s got huge stage charisma and a resonant arresting voice. Harding is equally mesmerising. She is incredible in concert, as if her life depends on the delivery of each song. Another Kiwi to watch is Nadia Reid. Music critics all over the globe are smitten with her music, largely due to her warm, intimate voice. Her latest album ‘Preservation’ is a spare listen, just her voice and an acoustic guitar, but it’s full of interesting utterances that can catch a listener by surprise. Nadia is touring NZ end of March, early April and tickets will be selling fast. Click on this for info http://nadiareid.com. Sing on NZ! Semper Femina is Marling’s sixth album and one of her best. The spotlight is on female friendships – relationships that have saved her, others more fractured and complex, all meaningful in some way. You can hear Marling’s influences at play: Joni Mitchell in ‘Nouel’; Nick Drake in ‘The Valley’; Neil Young in ‘Nothing Not Nearly’. But it is the close of the album that has stayed with me – the sound of determined footsteps, a slammed door. These mirror the sounds in the closing act of Henrik Ibsen’s play A Dolls House, as Nora Helmer leaves her husband and children in order to find herself. The year was 1879. Although Semper Femina doesn’t hurl its message full throttle at the listener, there is certainly a clear statement running through it – that woman can be as fickle and changeable as she wants, as she is free to be. The cover art of James Blake’s wonderful new album ‘The Colour in Anything’ is a visual representation of the musician. It was painted by the other Blake, 83 year old Sir Quentin, and shows Blake donned in an overcoat in a wintry English park, the sparse trees inhabited by menacing black crows. The artwork reflects the musical world in which James exists – a moody, colourless, smudged sonic palette. This is not to say that his music is dreary. Rather, he has humanised electronic dance music, by adding in elements of R&B, soul and folk. And then there is his warm choir boy voice which he uses as another instrument by cutting it to pieces and layering it so we often hear a multitude of Blake’s on one song. The last track on the album, the reflective ‘Meet You in the Maze’ showcases this. Just as Blake lent his voice to Beyonce’s ‘Lemonade’, so have Bon Iver and Frank Ocean collaborated with Blake on ‘The Colour of Anything.’ You’ll hear Bon Iver’s unmistakeable voice on ‘I Need a Forest Fire.’ Try to ignore the whoop at the start of the song – it’s really got under my skin! The Milk Carton Kids are a folk-duo from California whose music has been likened to Simon and Garfunkel, The Everly Brothers, Gillian Welch and Dave Rawlings. They are known for their gorgeous harmonies, clever guitar work and near-perfect song craft. To date the Milk Carton Kids have released four albums, all to critical acclaim, and bagged a grammy nomination and an Americana Music Award for their efforts. It’s somewhat presumptuous to be naming this year’s best album in April but, let’s be realistic, Sufjan’s ‘Carrie and Lowell’ could only be toppled by something earth-shatteringly magnificent. It’s from Misty’s album Pure Comedy which was released in April. I had listened to the album a couple of times but, missing the rich vaudeville feel of his previous albums, I’d left it at that. But this time was different. Whether it was seeing the world through a 90 year old’s failing eyesight or not, the song got to me. And that’s all you need with music isn’t it – to affect you in some way – to make you move or sing along or have a bloody good long sob (the latter in my case as I understood there can never be a magic mountain). The rest of the album followed easily. Father John Misty, a self-described ‘sarcastic Michael Buble’, is an outlier in the indie music world as he is possibly more fascinating than his music. He was once the drummer for the sleepy Fleet Foxes before he busted out with a rakish performance on Letterman’s Late Show singing ‘Bored in the USA’. If Pure Comedy gets under your skin, have a listen to Misty’s previous albums: Fear Fun and I Love You, Honeybear. He has also released a number of songs under his real name, Josh Tillman. They’re exceptionally maudlin. I love them but many don’t. Another beautiful and thought-provoking album is Sampha’s Process. It’s honest, intensely melodic and moving. You may have already heard Sampha’s husky soulful voice on albums by Solange, Kanye West, Drake, FKA Twigs and Frank Ocean. Now, with his debut album, he has come into his own. Rounding out this clever trio is Aldous Harding with her second album Party. I can’t stop listening to it and I’m wickedly envious of anyone lucky enough to get tickets to see her this June (http://www.undertheradar.co.nz/news/12568/Aldous-Harding-Announces-Two-Intimate-Shows-At-Aucklands-Historic-Pah-Homestead.utr). Harding has two voices – one reminiscent of Kate bush or Joanna Newsome, the other PJ Harvey – and each as captivating as the other. What astounds me about this album is both its quiet power and Harding’s deft control as she unfolds her thoughtful lyrics. Party is not something you’ll want to dance to, but it is a mesmerising and addictive listen. Compelling and unconventional with a memorable voice, 33 year old Natasha Khan has been likened to Kate Bush, PJ Harvey, Tori Amos and Bjork. 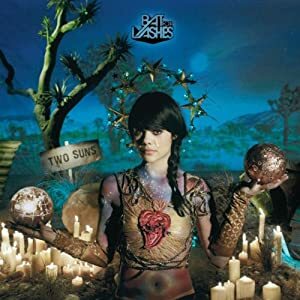 However Khan, more commonly known as Bat For Lashes, is carving her own track with her emotive, and sometimes theatrical but never ordinary, indie-pop/dream-pop songs. Khan had produced three albums since 2006: ‘Fur and Gold‘; ‘Two Suns‘; and last year’s ‘The Haunted Man‘. What I love about her music is that it’s unpredictable and catchy all at the same time. There is a jubilance, an exhilarating freedom, in many of the choruses to her songs that grabs you unexpectantly (especially given the raw subject-matter). Khan’s voice is the centrepiece of everything and its authentic quality holds us steady amongst the noise – the stirring orchestral strings, the all-male backing choirs, the emergence of unusual instrumental sounds that are purely electronic in origin. And, somehow, it all seems to work. Drop the “B” – it’s Ryan, not Bryan. I have been carrying on an unrequited love affair with Ryan Adams for many years now. It all started in 2003 when I was listening to a Beth Orton song, ‘Concrete Sky’. I found myself focussing on the voice supporting her. It was a voice I wanted to climb into, the perfect foil to Beth Orton’s quirky Londontown sound. It’s the middle of winter, with perfect storm conditions brewing outside. You’ve settled yourself on the couch in your comfy, ‘at-home’ clothes (more commonly known as pyjamas) when you remember you’re meant to be downtown meeting friends at a bar. A no-show is out of the question and you’ve used the flu-card too many times lately. Now would be the time to put some music on that actually makes you feel like getting out there. I’ve used this technique many times and, apart from a spot of concentrated pre-loading, it’s the next best thing to ensure you fling off your slippers and head on out.